We refer the term Biotic to living things while abiotic things are those which are non-living. Organisms which obtain nutrients, perform metabolism, produce energy, and can move about in the surroundings are biotic. They can grow, reproduce, maintain homeostasis, adapt, and evolve. Abiotic example are – a rock, soil, etc. Sometimes an ecosystem is divided into biotic and abiotic ecosystem. 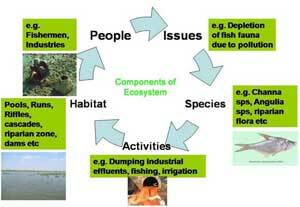 The community of the organisms living in the area comprise of the biotic components of the ecosystem. The community includes the organisms and actions such as mutualism and predation. And the environment in which the organisms thrive is the abiotic ecosystem. The abiotic components include the energy produced through the cycling of nutrients, the solar energy, and other non-living components in the ecosystem. The abiotic components of the ecosystem can be temperature, light, air current, etc. Biotic components shape an ecosystem and are the living components in the organism’s environment. In a grassland ecosystem, biotic components can be categorized as producers, consumers, and decomposers. The producers capture the solar energy, use the nutrients available, and produce energy. For example, grasses, trees, lichens, cyanobacteria, etc are producer. Consumers do not have the ability to produce or capture energy on their own and depend on the producers. They are the herbivores, carnivores, and omnivores. Decomposers break down the organic layer providing nutrients for the producers. Insects, fungi, bacteria, etc. are examples of decomposers. In the grassland ecosystem, soil is the important link between the biotic and abiotic components. Abiotic factors affect the living organisms in a community. In a barren ecosystem new organisms start colonizing the ecosystem. They depend on the environmental components to thrive well in the system. These environmental components which facilitate the thriving of the organisms are the abiotic factors. It can be the soil, climate, water, energy, and anything helping the sustenance of the organism. The abiotic components impact the evolution cycle. In an ecosystem, if one factor is altered, it can impact the whole system. The availability of the other resources in the system can be impacted as a whole. Human beings are capable of altering the physical environment through development, construction, farming, and pollution. As a result the abiotic components in the system change and affect the biotic organisms. Global warming affects many organisms like plants and microbes. Acid rains have resulted in the destruction of the fish population. Apart from biotic and abiotic factors, there are some factors which determine the number and types of organisms in a system. These factors are known as limiting factors. The limiting factors are capable of restricting the overpopulation of any species. At the Arctic, the permanently low temperature restricts the growth of trees and other plants. Manisha Kumar. "Difference Between Abiotic and Biotic." DifferenceBetween.net. August 29, 2017 < http://www.differencebetween.net/science/difference-between-abiotic-and-biotic/ >. This is very interestin to learn about yall. Thank you very much for making me understand more about the Abiotic and Biotic!! i real appreciat it’s! thanks 4 providing this information..
add some more and important points to this……. this website got an 100 on my test and now my grade went from a C+ to an A- this site is a very good rescours.